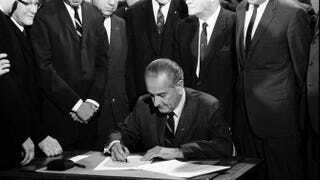 President Lyndon B. Johnson signs the Fair Housing Act in 1968. Before former Sen. Edward Brooke (R-Mass.) died earlier this month, one of his final acts of advocacy was an effort to save the Fair Housing Act—and the Supreme Court should pay close attention to Sen. Brooke’s defense of this landmark legislation as it considers the future of this law. Sen. Brooke was the first African American popularly elected to the U.S. Senate, but more importantly, he was a gifted and effective lawmaker and strategist who shunned partisan politics and pushed for vital civil rights policies. Brooke, a Republican, co-authored the Fair Housing Act with former Democratic senator and Vice President Walter Mondale. Nearly 50 years later, together with many other lawmakers, the duo filed a friend of the court brief in Texas Department of Housing and Community Affairs v. the Inclusive Communities Project. The case is straightforward. Texas doesn’t have an official policy of racially segregating its tenants, but that’s what it does in practice. As lower courts have acknowledged, Texas keeps low-income housing out of white neighborhoods and pushes it into black ones, thereby forcing its low-income tenants to live in segregated communities. The plaintiff is a fair-housing group that has asked Texas to allow low-income housing tenants to live in all communities, not just black ones. The state is arguing that, because it’s not discriminating on purpose, it should be allowed to continue cramming low-income housing into black communities. This discrimination denies all Texans—not just minorities—diverse and vibrant neighborhoods. The brief Sen. Brooke joined couldn’t state his position more clearly: Congress intended the Fair Housing Act to stop housing discrimination, whether it was done on purpose or not. Indeed, since the act’s passage, tenants and homeowners have relied on its protection from discrimination against people of color, women, people with disabilities, religious minorities and even families with children. The fact that the court is even taking a case challenging a central component of the Fair Housing Act is extraordinary to those of us who have witnessed the law’s transformative power over generations and the widespread bipartisan consensus that passed it in 1968, expanded it in 1988 and validated it in all 11 federal circuit courts. The component of the law in question, known as “disparate impact,” was even codified into federal regulation last year by the Department of Housing and Urban Development. With unanimity in judicial, administrative and congressional opinion on disparate impact, it would be a historic break for the Supreme Court to overturn this consensus. But given this court’s gutting of the Voting Rights Act in 2013, anyone who cares about equal opportunity in America should be paying close attention. The civil and human rights element of this is impossible to ignore. The Fair Housing Act was enacted during the turmoil that followed the assassination of Dr. Martin Luther King Jr., who was a stalwart advocate for fair-housing laws. At the time, rampant housing discrimination was largely responsible for the deplorable conditions in many urban centers. With residential segregation on the rise, a strong Fair Housing Act is needed now just as much as in the past. But if the Supreme Court decides to gut this law, families will be left without protection and we won’t be equipping our nation to thrive in the 21st century. Gutting this law would be disastrous for our nation’s communities. The court should take a close look at this law’s incredible impact, Sen. Brooke’s brief and the 45-year congressional and judicial consensus that all point to keeping the Fair Housing Act intact. Wade Henderson is president and CEO of The Leadership Conference on Civil and Human Rights, a coalition of more than 200 national civil rights groups.